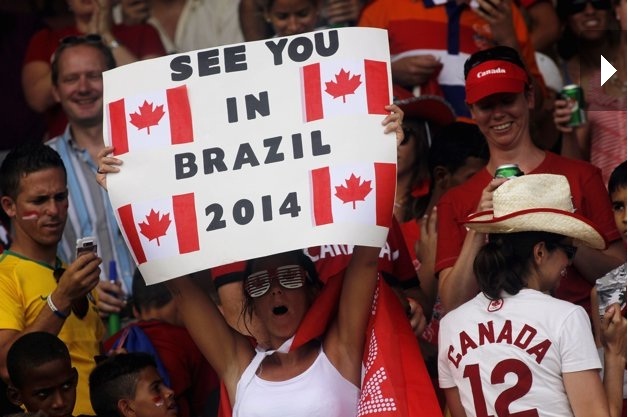 This time could be it for Canada men football national team to book their ticket to Brazil World Cup 2014 for the second time in country’s football history. Drawn in World Cup qualifying Group C along with Panama, Honduras and Cuba, Canada is trailing Panama for leading the group. With 1 win and 1 draw and in second spot, that makes Canada-Panama match even more significant tomorrow, September 7th at BMO field. The challenge is, this time around, CONCACAF, which is the name for teams in North America and Central American zone, is allocated one fewer World Cup qualifying spot by FIFA than previous years, to be able to advance to the Finals. CONCACAF’s previously 4 spots would now have to be reduced to 3 spots, with top teams of 3 groups, plus the 3 runners-up of the 3 groups would have to fight it off for top 3 spots who can then directly head to Brazil. The 4th-placed team though has a chance to also qualify to World Cup should they beat Oceana’s first-placed team in an inter-confederation play-off. But until Canada gets to that point, they are in hunt to seal their top 2 finish in Group C, with the hopes of dominating Panama with a win tomorrow. Considering that tomorrow’s match at BMO field is Canada’s last home match in this round, from then on Canada need to prepare for grabbing as many points as possible at Panama’s turf on September 11th, followed by an easier match against Cuba on October 12th, and Honduras on October 16th. That is how Canada coach describes the road ahead in his pre-match interview on Wednesday: “You have four games (remaining) and you have to look at it that way, but a game at home against arguably the best team in the group is extremely important,” said Canadian head coach Stephen Hart. If Canada succeeds to finish among top 2 teams, then in the next round, the red-jerseys would face their usual top-tier opponents U.S, Mexico, possibly Jamaica, Costa Rica and Panama. The real task is for Canada to make the best out of that potentially tough group and seal their way to Brazil among top 3 teams. Can Canada national team make history this year and advance to World Cup Finals? We shall wait and watch. Nonetheless, in the meantime, as a proud Canadian citizen and football follower, I’ll be present at BMO field tomorrow to cheer Canada team; Whistles, Canadian flag, and even makers for face-painting are all coordinated!